Blogger and I made up. Do you still have all of your fingers? Those rotary cutters can be vicious! Lay your pieces out on the table that you have wanted to paint for 7 years. Get annoyed that you still haven't painted said table. Nothing like making you really want to paint something when you have to take pictures of it and blog them for all to see your ugly table. 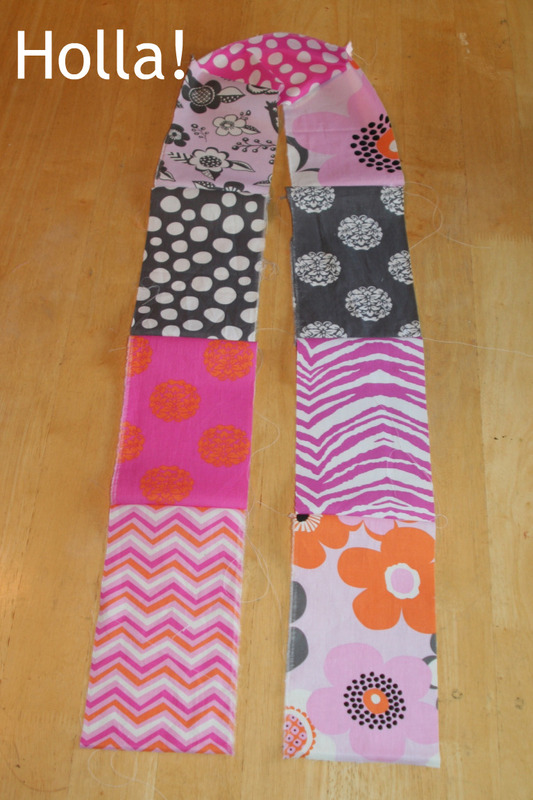 Anyway, lay them out like you what you want the final scarf to look like. Play around with the fabrics, see which ones flow nicely into the next ones. 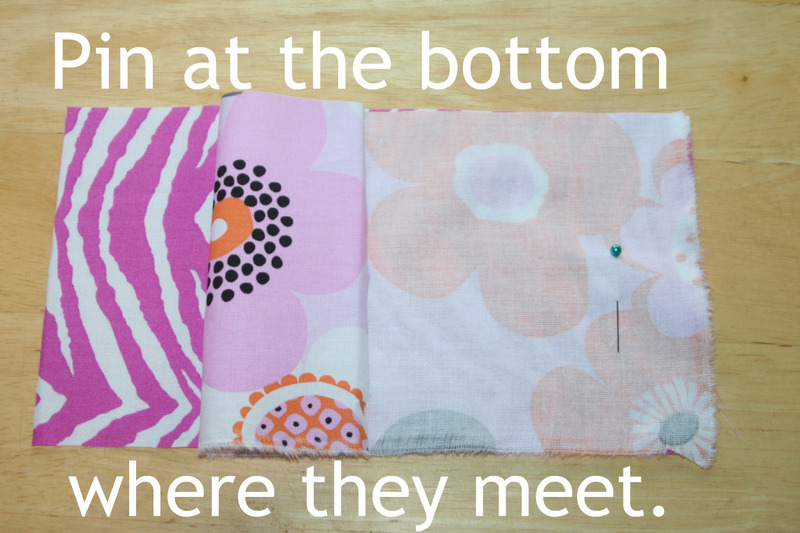 If one of them is cute, but doesn't totally fit with the rest, put it at the top, or fabric #5. This fabric will most likely be hidden behind the scarf wearer's neck. 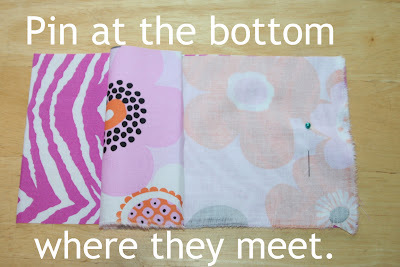 Now all of the fabrics that I am using don't have an up or down. But because I am sure that some of yours do I put two in for illustration purposes. Make sure that they go the right way. It might seem simple, but believe you me I have sewn way too many things upside down in my day. Once you have an arrangement that you love, keep them on the (ugly) table. This is the order that you will pin in. You might come across the abbreviations RST or WST which stand for Right Side Together or Wrong Side Together. 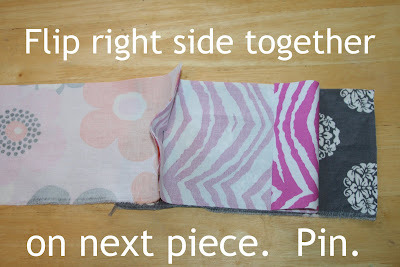 In general you want to put Right Sides Together and pin on the Wrong side. Take the bottom edge of your bottom piece. Flip it up and on top of the right side of your piece #2. What was the bottom of the bottom piece will now be at the top. Pin at the bottom about an inch from the edge. See how I folded back the piece? Both of the Right Sides are facing each other. After pinning, open up the two pieces, keeping piece #2 still on top. Now flip piece #2 on top of piece #3. Line up the edges, smooth it out and pin. Keep working your way around all nine pieces. Flipping, lining up, smoothing out, pinning. 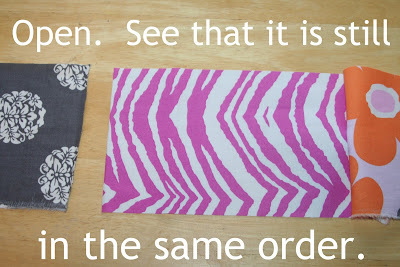 Turn the scarf Wrong Side down and check your work. None of the Wrong Side should show. 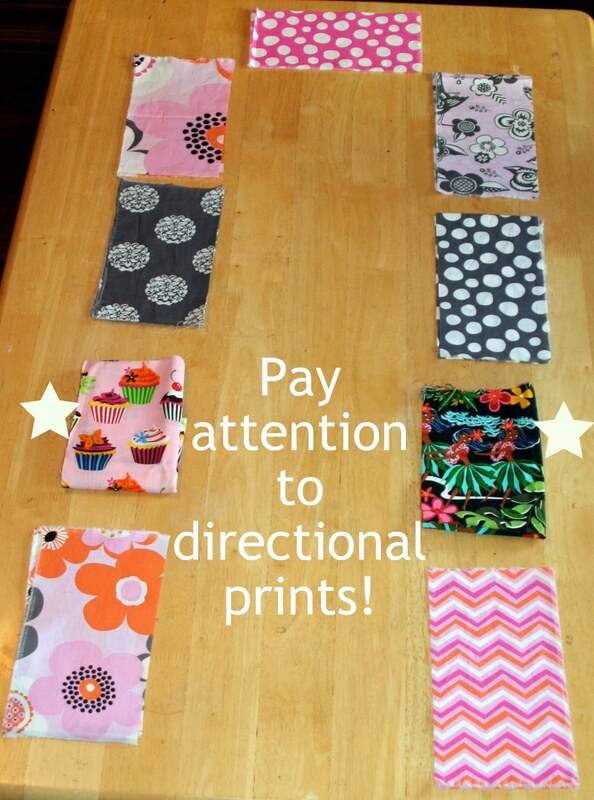 Try it on and look in the mirror to make sure that any directional prints aren't upside down. Lots of lined up edges all ready to be sewn. You are doing really, really good. 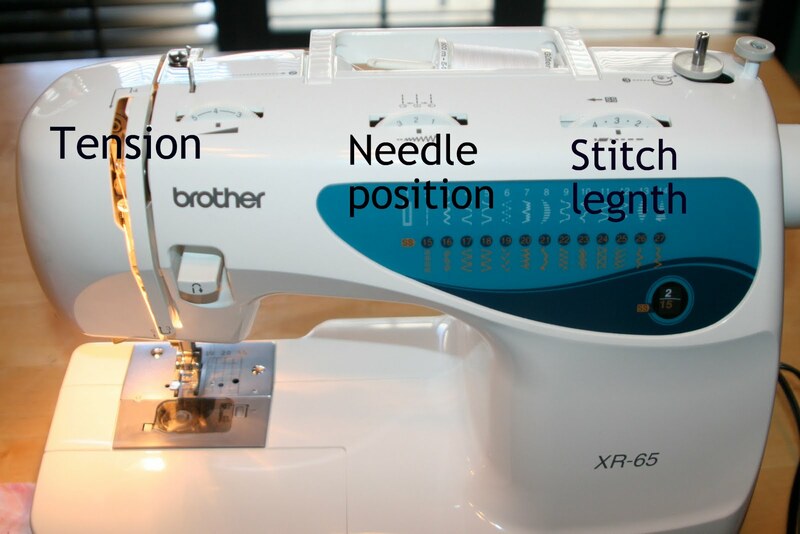 This is the settings that I use for normal sewing. Your machine most likely will be different, but I just wanted you to have something to go off of. My Tension is set at 4. My needle is in the center position. 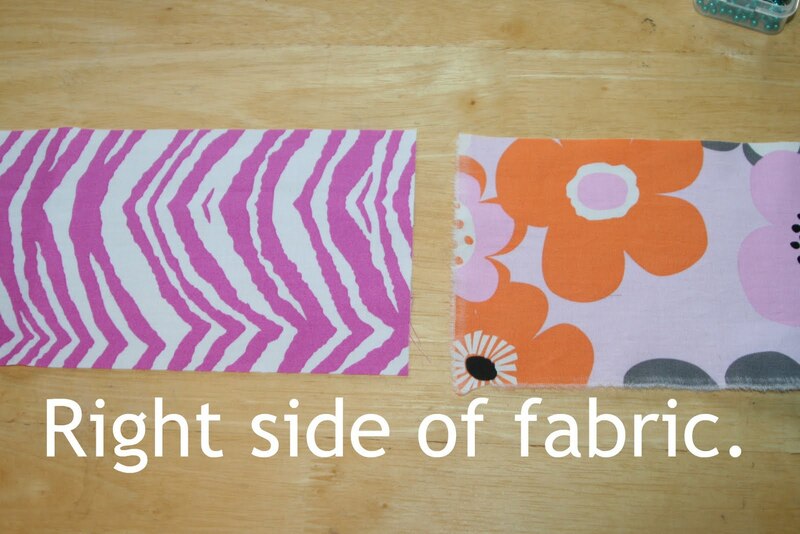 Which is about 1/2 inch seam allowance. 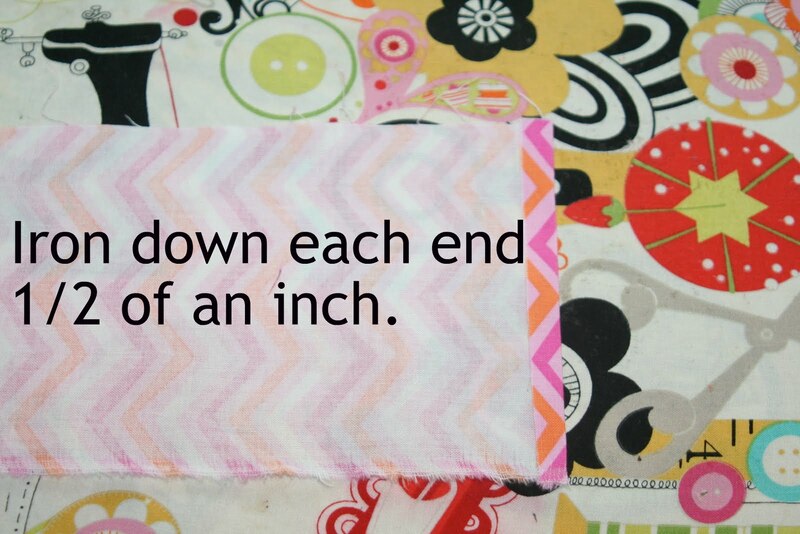 My stitch length is set at 3. If you did your homework, hopefully you figured out a formula that works best for you. You did your homework, right? Pull up the needle with the knob on the right. Pull up the foot with the lever. 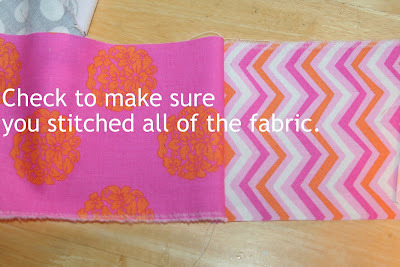 Put the pinned edge of fabrics #1 and #2 under the foot. Click this picture enlarge it so you can see how it is lined up. Turn the knob to put the needle in the fabric. Press the foot pedal slowly. This loopy arrow is the backstitch. 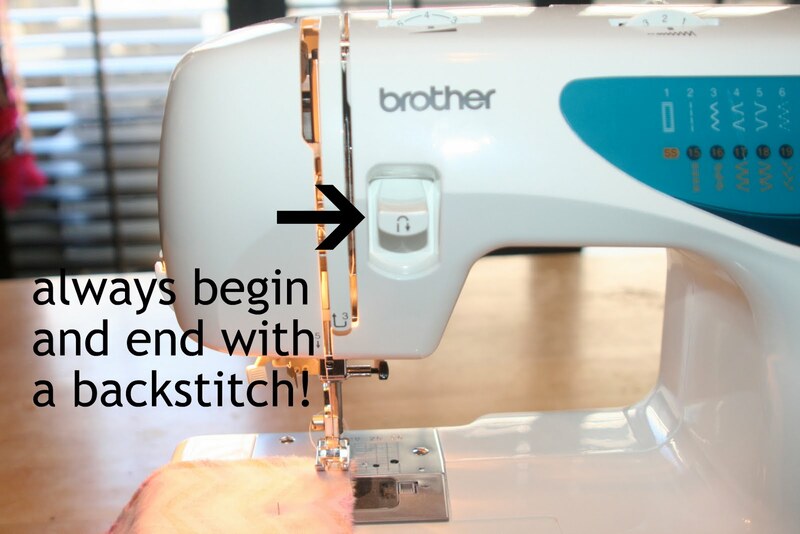 The backstitch locks your row of sewing so it doesn't unravel and make your cry. It is so very, very important that you remember to do a few backstitches at the beginning and end of each row. 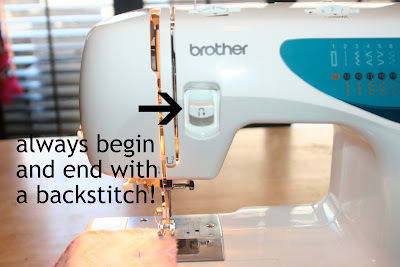 After backstitching, press the foot pedal and sew to the end of the fabric. Turn the knob so the needle goes up. Pull the fabric and thread out 6 or so inches. Most machines have a little razor thing that you pull your thread down on and it cuts it for you. 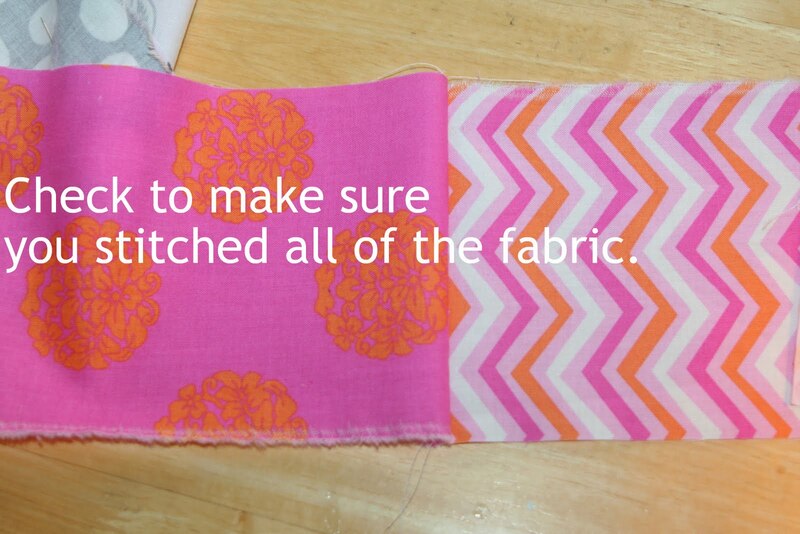 Move on to the next two fabrics that are pinned together. 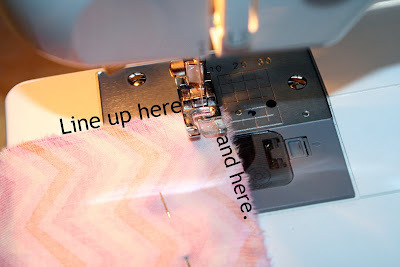 Before you line it up under the needle, pull out a bit of thread and bring it to the back of the machine. If there isn't enough thread pulled out, when you begin to sew it will pull it out of the eye of the needle and you'll cry and hate sewing and rethreading, and no longer like me. 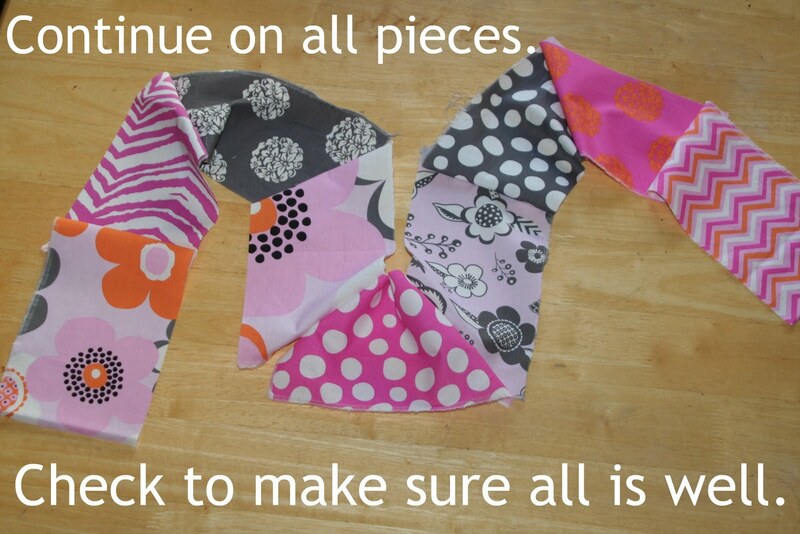 Keep doing the above steps until all of the pieces are sewn together. 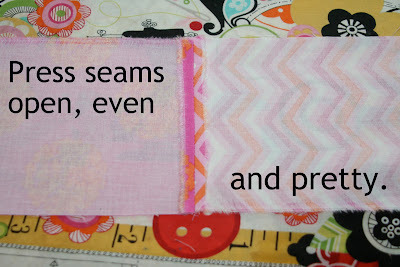 Open up all of the seams to make sure there are no gaps where you might have missed some fabric. Lay it out on the (ugly) table and admire the awesome. Now to my least fave parts of sewing. Go to the couch. Get some scissors. Put something lame on the TV. Something mildly entertaing, but that doesn't need your full attention. For me that used to be the Hills. But I am boycotting it since LC left. Clip all of the hanging threads from each side. If you don't, they will get in the way later. Now get your iron out. Put it on the hottest setting and fill it up with water if you have a steam iron. 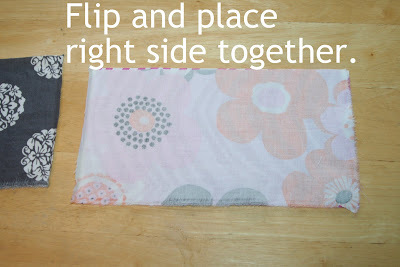 Place your fabric Right Side down on the board. Iron down each end 1/2 inch. Then carefully iron each seam open. 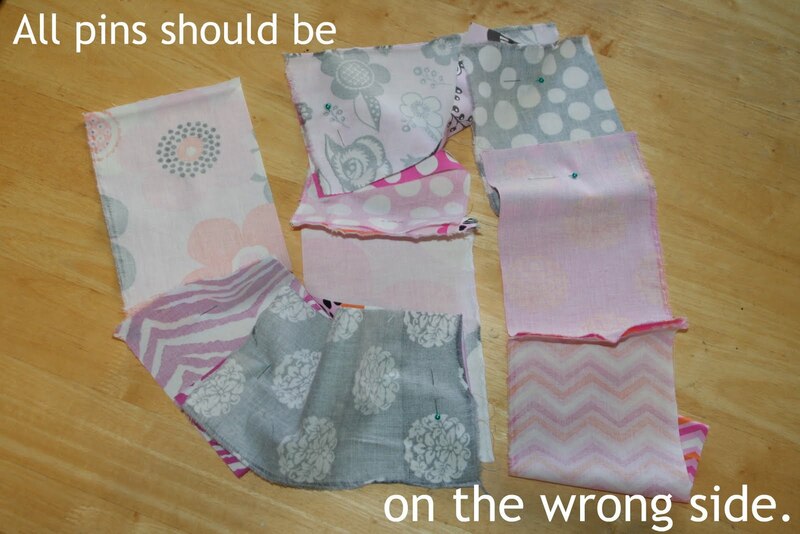 Be mindful not to pull the seams and make them all wonky. Just simple pressure and a burning hot iron should do the trick. Then grab your nearest cute baby and try it on them. 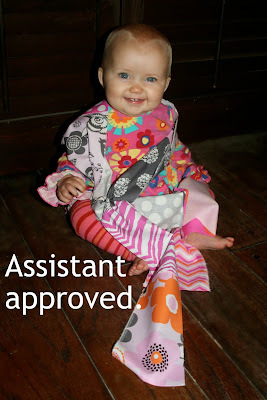 Because cute babies always make for a good end to a successful sewing session. On Monday we will finish our scarfy goodness. Please upload your progress to the Flickr group. I would love to see how you are doing. Plus, it is a great place to get your questions answered by other members and I may or may not be randomly giving scarves away to a few of you cool kids. oh..... i bet the blogger thing got fixed! YEAH! i don't know HOW you do it all... and moving to boot! I'm not really doing this. I never actually *used* my sewing machine until late last night. And today I made a patchwork pillow! 9 charm squares in front, 1 fat quarter in back. 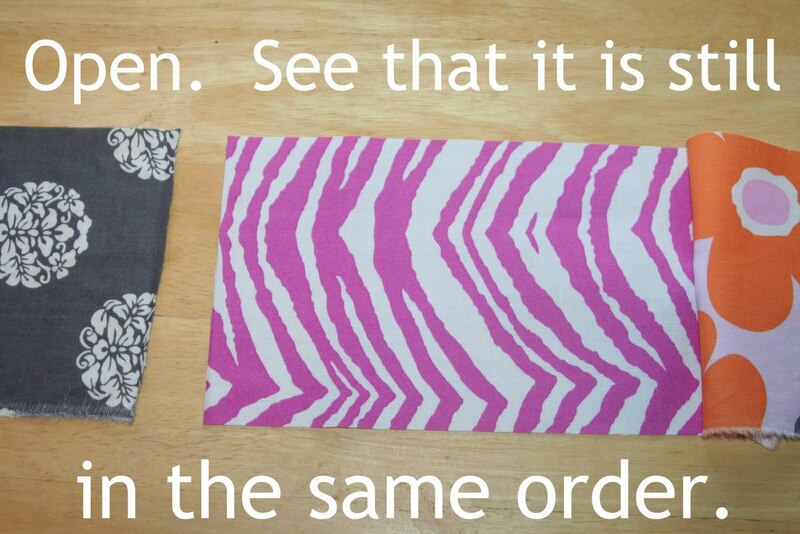 I do have stuff to make scarves though. I'm going to make them patchy on one side and soft solid fleece on the other. Cuz it's cold where I live! you are rockin' it julie! Thank you for the great step by step instructions they are great!! I'm so excited! I'm sewing!!! But how many of these do I do? Oops! Crap... this is Tegan, somehow I'm commenting as Tage... hahaha! Loving the project, you are so great, don't know how you have time for it all!!! Can't wait to see what other fabulous projects you come up with. i think, though, that we might get along famously if given the chance. turns out, though, that i live in minnesota. which isn't so close to you. so, we'll have to settle for this! 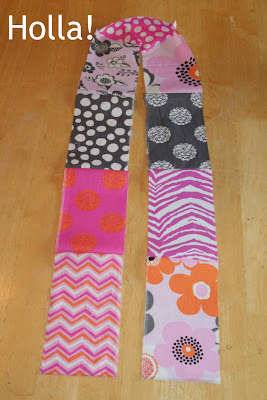 i don't sew, but your scarf is coming along beautifully. We couldn't wait!! We've plowed ahead and sewn and now we learn what we should have done :-) Ah well, we'll do better next time - like tonight lol! 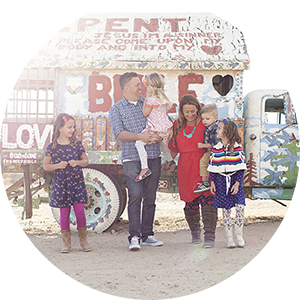 We are having great fun doing this together as a couple - thanks! THANK YOU for doing this! 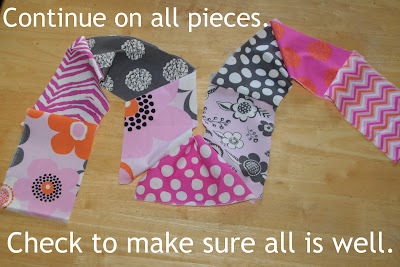 I already know how to sew, but I LOVE this cute (quick) craft just in time for the holidays. I must admit, I have jumped ahead and finished 2 already and I LOVE THEM! I can't thank you enough! If you lived nearby, I would bring you a tin of gingerbread for your trouble! 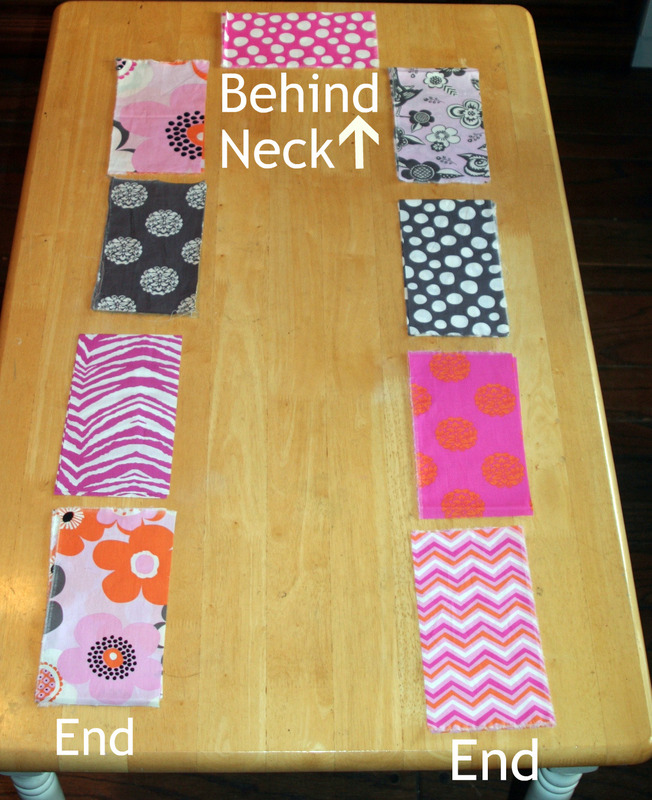 I just spent way too much time trying to arrange my fabric rectangles...OCD much!? At least they are all pinned, my sewing adventure will begin tomorrow. Did I just hear an ominous dun-dun-duuun!? I <3 you and your super easy to follow instructions!! I cut fabric all by myself and I'm about to go sew by myself for the first time ever! !